Got leftover corned beef? This time of the year, you just might. 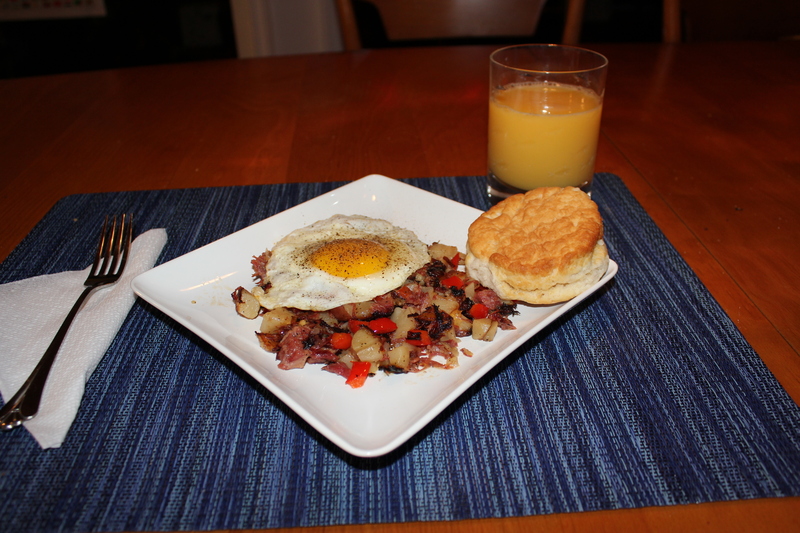 One great way to use those leftovers is to make this easy corned beef hash, which is great for breakfast or dinner. I like to cover mine with tomato slices and sharp cheddar cheese, but you may want to make yours a bit more traditional and top it off with a fried egg or two. Either way is delicious! Melt the butter over medium heat in a large skillet. 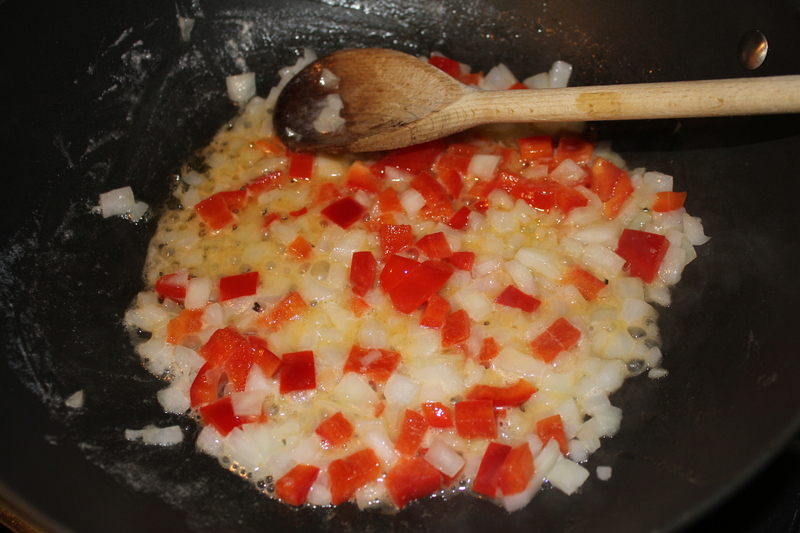 Add the onion and red pepper and sauté for a few minutes. Flatten the mixture with a heavy spatula and let it brown on the bottom. Flip it over and brown the other side. This is when I like to add a few slices of tomato and sprinkle the top with sharp cheddar cheese. Cook until the cheese has melted. Serve with a fried egg on the side and some sort of bread. 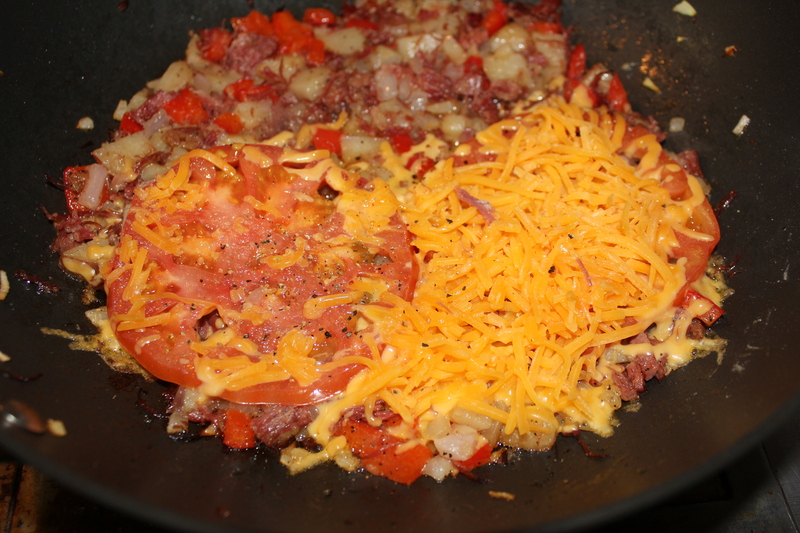 Or else skip the cheese and tomato and top the hash with a fried egg or two. Serve with some toast or a biscuit. 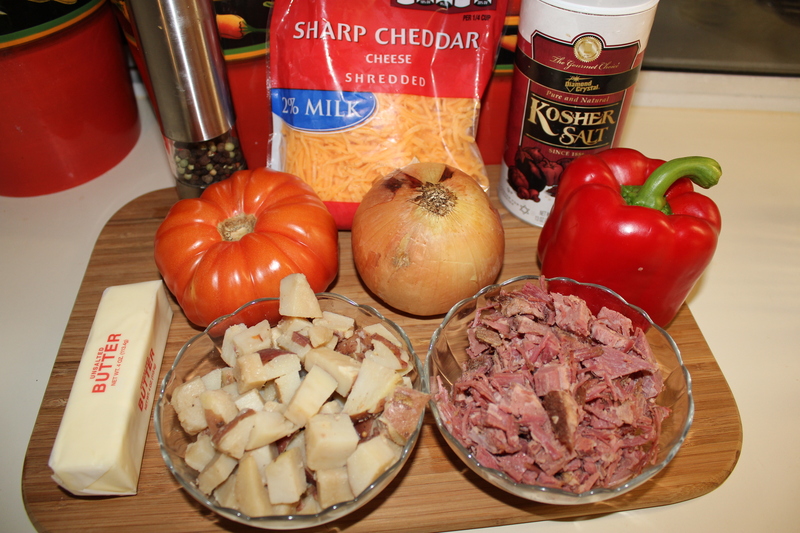 This entry was posted in Meat and Poultry, Recipes and tagged Corned beef hash, corned beef hash fried egg, Corned beef hash tomatoes cheese, eat drink and be merry, kel's cafe of all things food, kel's cafe recipes, Kelley Chisholm blog. Bookmark the permalink. Looks delicious! 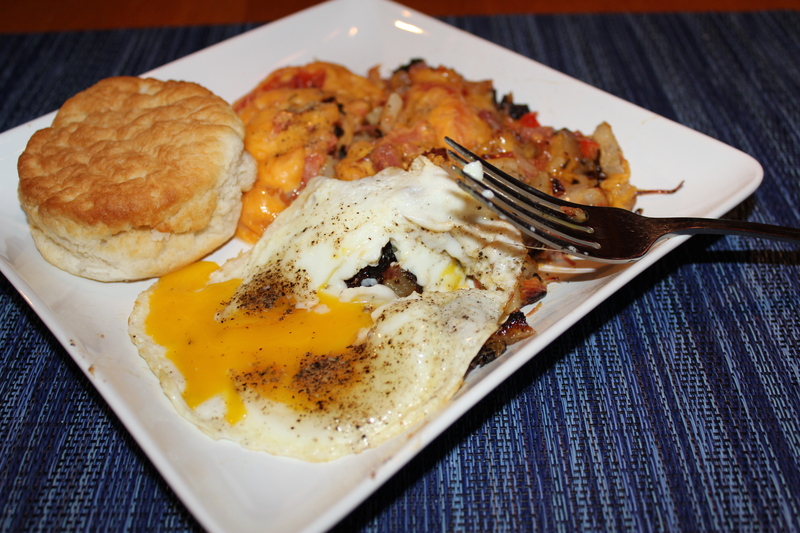 Love corned beef hash! I do too, especially for a late-night dinner. 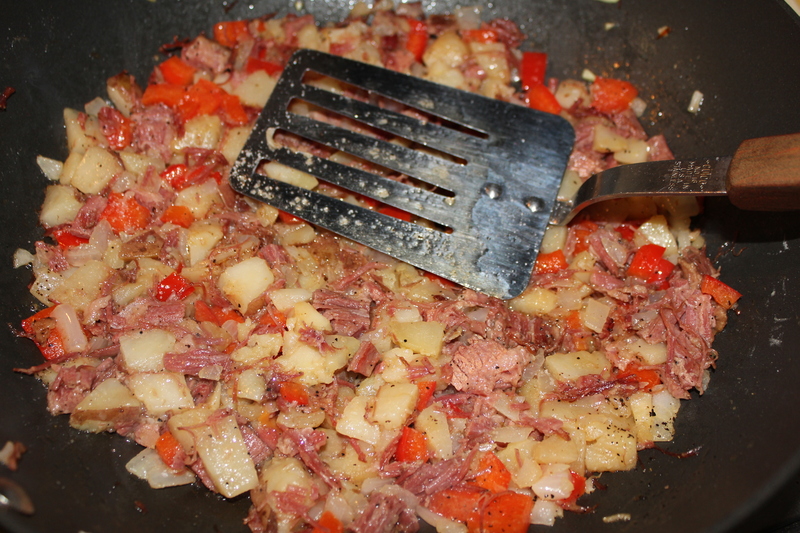 I think one of the reasons we all like cooking a corned beef is for the left overs and hash is my favorite way of using all the crumbly little bits that result from slicing . Yes, I love the hash, and I also love Reubens, which I’ll be posting about soon. I certainly get my money’s worth out of a corned beef brisket! Excellent, now I know what to have for supper tonight. I don’t think I’ve ever had it with red bell pepper before, but I bet it’s yummy! For as long as I can remember, I always use green or red peppers in this. Maybe because when I was in college I just used the canned corned beef (better on my budget!) and wanted to add more flavor to it!